For those who use charts for trading candle sticks should be very familiar to them. A candle stick plot shows us the open, high low and close of a timeframe with a solid body between the open and close of the candle. The high and low will be represented by “wicks” if the open or close price was not the high or low of the period. There are a numerous candle patterns which form on a regular basis but let us take a look at one which is overlooked by many but can give you a heads up on direction change. Let me show you a chart. Tell me what do you see? Most traders would be quick to point out that this is a double bottom formation. They would be right. 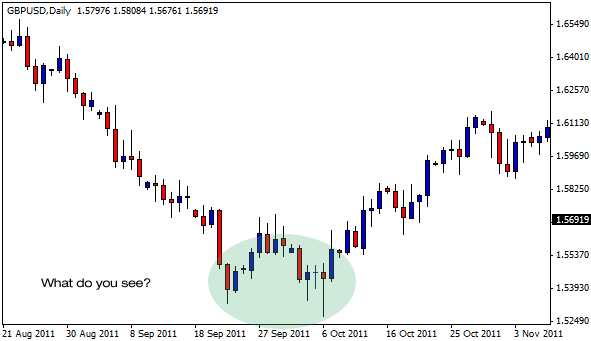 But can you spot the clue as to when this double bottom was about to change direction? It’s really quite simple and the reason that this pattern forms is too. In the above chart the price was trending down and found a low at which point the market retraced to retest higher prices. But this isn’t what we are looking for. The pattern we are looking for is the retest of that low followed by a strong rejection of the area signified by a long “pin” type wick on the candle. The 2nd last candle within the highlighted area is the one we are interested in. During the formation of that candle prices dropped to test support of the previous low, and actually briefly broke the low. However this was a “fakeout” and price quickly reversed to end back up near the open and high then continued into the next day. Often this sort of “squeeze” to the extremes brings out momentum in a new direction (or in a continuation) which allows you to profit. So with this in mind let us look at some further examples of these pin type candle formations. This example is not as clear cut as the first one but nonetheless it’s there. 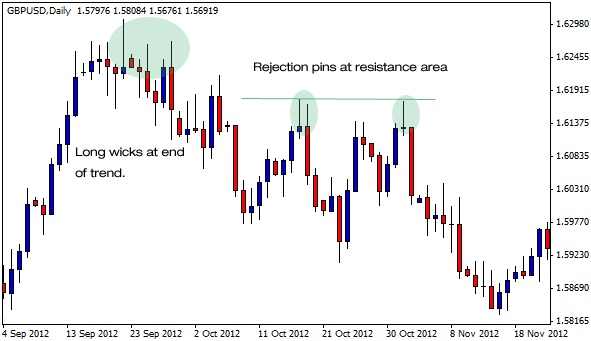 There are clear retests of a resistance area with rejection pins. 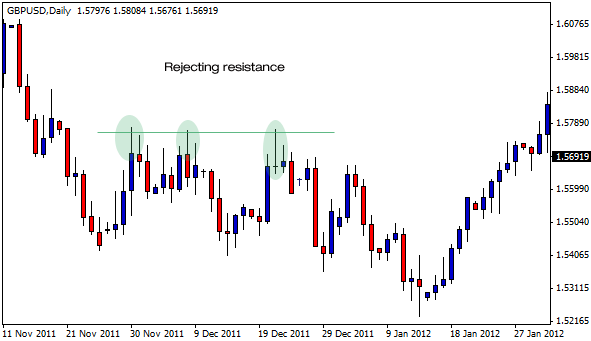 These are being formed by price moving towards a previous resistance and being quickly rejected by market participants. This pattern should be telling you that lower prices will be achieved as the market tries to find volume at another (lower) price area. Once you train your eyes to find these types of candles you will notice them time and time again around the ends of trends, at support and resistance and even at Fibonacci retraces. In this above example there were a few long wick candles formed at the top of a trending move. The subsequent break below those candles was the first indication that the direction was changing. Next we got a series of further rejections of highs at resistance. Each rejection produced a good amount of pips to the downside, over 100 pips on the first and nearly 300 on the 2nd. These patterns happen in most time frames however I would say they are most effective in longer time frames, 60 minute, 4 hour, daily and even weekly. Try an experiment, load up a chart (any chart) switch on to candles, look at tops, bottom and retraces in trending moves and tell me what you see. ur site is very informative, but if u also give charts and guidelines for all base metals then it will be very encouraging as no other sites gives all metals charts. It is very useful study charts with this expalantion. please update further. Very informative post, Pete. Candlesticks are extremely important.